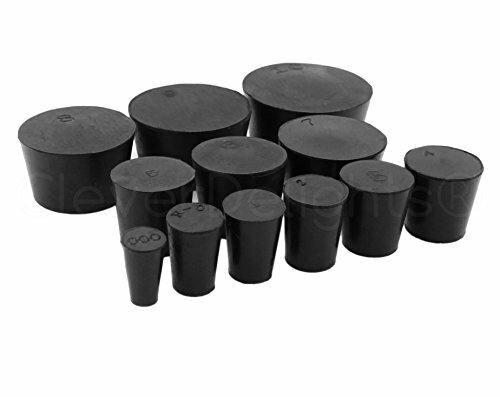 12 Pack - CleverDelights Solid Rubber Stoppers - Mix Pack - Sizes 000 to 10 - 1 Each Per Size. Ideal for plugging test tubes, laboratory vials and containers. Made from natural rubber and ships from a USA warehouse. Great for lab, household, and industrial use. Black color. Other sizes ranging from #000 to #14 also available on Amazon. See the 2nd picture for a table of all the sizes we carry. View More In Lab Supplies & Consumables. If you have any questions about this product by CleverDelights, contact us by completing and submitting the form below. If you are looking for a specif part number, please include it with your message. American Educational Chrome Medium Point Forceps with Pin 4-1/2 Length (Bundle of 10)"